A Virginia teenager driving his mother’s Kia Soul in July saw smoke and pulled over. He said the “whole car went up in flames” in about five minutes, burning to a shell of its former self. Hundreds of others reported similar, prompting an advocacy group to demand Hyundai and Kia recall 2.9 million vehicles. The Center for Auto Safety, a national advocacy non-profit founded in part by Unsafe at Any Speed author Ralph Nader, has a strong hunch that fire in Virginia is part of a far bigger problem—one spanning five models and several years in the Hyundai and Kia lineups, and one that it claims Hyundai, Kia and the U.S. National Highway Traffic Safety Administration have yet to do a recall on. That’s why, in a press release Friday morning, the center called on Hyundai and Kia to recall all Sorento, Optima, Sonata, and Santa Fe models from the 2011 to 2014 model years and all Kia Souls from 2010 through 2015 for fire hazard. That makes nearly 2.9 million vehicles, and the release said between the center and the NHTSA, there have been more than 220 complaints of non-collision fires in these cars—almost one per day for the last four months, with some saying fires started while they were on the highway. Kia has yet to respond to Jalopnik’s request for comment, but a spokesperson for Hyundai Motor America told Jalopnik the root of this issue has already been addressed and recalled. The “only defect trend causing non-collision fires,” the spokesperson said, is one Hyundai has already identified in two previous recalls: a 2015 recall on Sonatas from the 2011 and 2012 model years, and a 2017 recall on 2013 to 2014 Sonatas and Santa Fe Sports for similar issues. In some very rare instances – a rate of less than 1 percent – the affected engines have caught on fire. An exhaustive study has confirmed that there is no defect trend outside of that identified in the related recalls causing non-collision fires in Hyundai vehicles. In a petition to the NHTSA in June, the center said at least 120 owners reported cars catching fire without any prior collision and that 229 reported “melted wires in the engine bay, smoke, and burning odors, indicating potential fires” and indicating that this trend seems to start in the engine bay. The center also said in at least a dozen complaints, owners said their car also had an engine-related recall done on it before it caught fire. When asked if there were any updates to the NHTSA’s investigation into the fires from the center’s June petition, an NHTSA spokesperson told Jalopnik on Friday that the petition remains under consideration. The investigation includes information requests sent to Hyundai, Kia and other manufacturers about the reported issue, which the NHTSA will then review to make its decision. 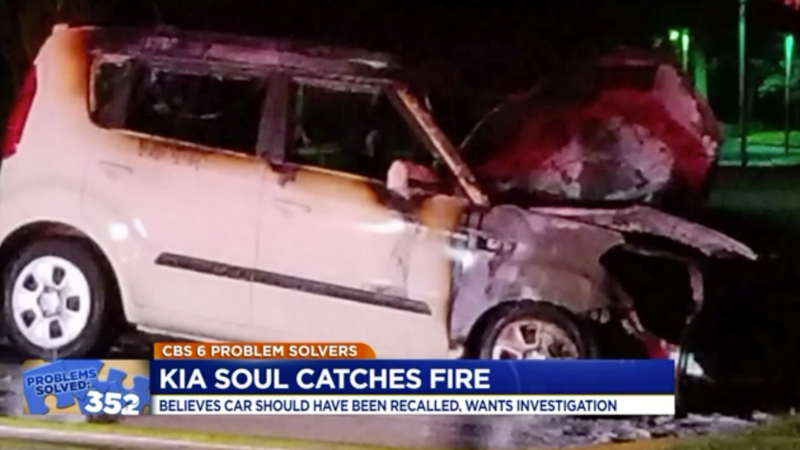 As for the Soul fire in Virginia, the mother of the teenager driving the car said in July that she was still responsible for a large portion of the payments she had to make on the car, despite it being burned far past any level of usability.